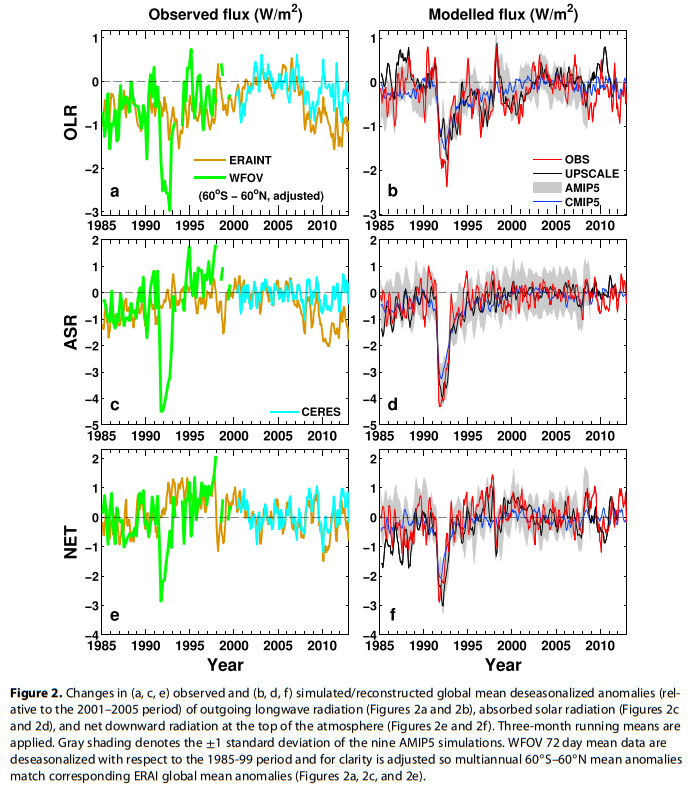 “Nate” seemed overly confident that this paper obliterates my entire argument – that there is no trace in 33 years of high-quality radiation flux data (ERBS+CERES) of an “enhanced GHE” contribution to ‘global warming’; that the data instead unequivocally shows that the Sun is behind it all; not –OLR accompanied by –ASR, as claimed/implied by “Mainstream Climate Science” (‘MCS’), but rather the opposite: +ASR accompanied by +OLR. So, is “Nate” correct? Am I proven wrong? However, the long answer is much more interesting, for it brings to light certain aspects of the obvious bias lying at the heart of the entire “Mainstream Climate Science (MCS)” endeavour and how it manifests itself in the analysis of climate data. The general thought process is so overwhelmingly controlled and constrained by the “AGW” idea, the reigning (and, in most people’s minds, undisputed and unchallenged) “climate paradigm” of our time, that more CO2 in the atmosphere MUST cause (and IS causing) ‘global warming’, that people – SMART people! – don’t even think twice about it. They simply look past it. It is just taken as established fact. Gospel truth. Even when, in actuality, it is no such thing. Well, I’ve been ranting about this silliness on this blog before, so I will stop here. And rather have a closer look at the paper at hand: Allan et al., 2014. Because it’s a good opportunity to delve a bit deeper into this matter. So what is the issue? What is the bone of contention here? “We know what happens within those two consecutive timespans [1985-1999 & 2000-2017], covered by each radiation flux dataset [ERBS & CERES] separately and in succession. That’s really an open-and-shut case. The persisting pattern is unmistakable, undeniable. Figure 1. 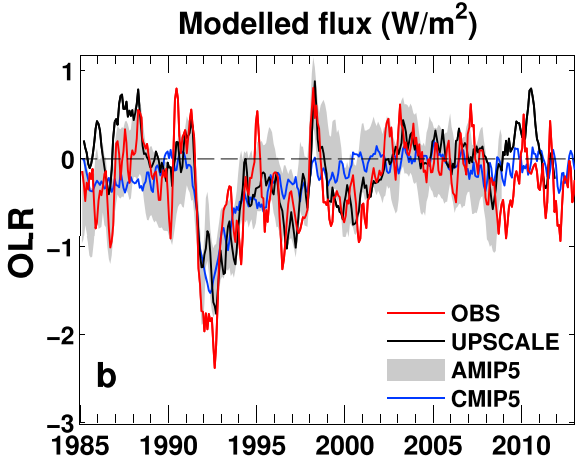 How the ToA radiation flux anomalies evolved within the 15-year ERBS period (1985-1999). Figure 2. How the same ToA radiation flux anomalies have evolved within the 18-year CERES period (2000-2017). We see that all fluxes, ASR (Qin(SW)), OLR (Qout(LW)) and Net alike, grow in intensity from start to finish within each separate period. 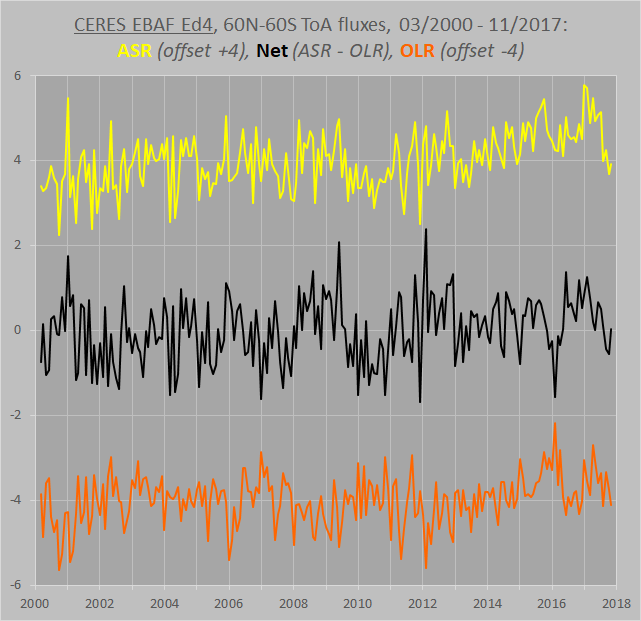 Within each segment it is obvious that the ASR and the OLR both increase, only with the increase in ASR larger in both cases, which in turn is the reason why the Net flux (ASR minus OLR) is also observed to increase in both cases, albeit much more distinctly within the first (ERBS) period. And so it all seems pretty settled already. But it isn’t really. We have to find out what most likely happened across that 1999-2000 data gap between the ERBS and CERES datasets in order to be absolutely certain. I turned my focus on the OLR, noting how it appeared to track, to an impressive degree, tropospheric temps over time within each of the two separate periods (true both for the tropics (20N-20S) and for the near-global (60N-60S)), a circumstance which seems to make perfect sense, considering how the OLR should really for the most part simply be a radiative effect of tropospheric temps – the thermal emission flux of (primarily) Earth’s troposphere. My initial hypothesis – the first ‘guess’, so to say – then became, based on this very observation, that the OLR would also track the tropospheric temps across the 1999-2000 data gap. 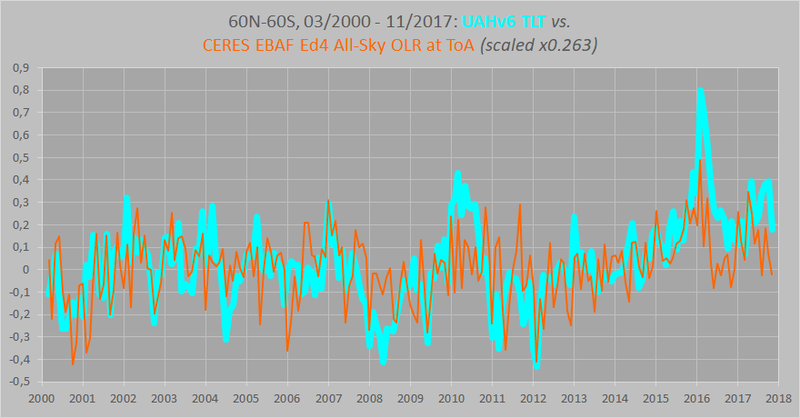 It’s a fair first step; seeing how the OLR and the TLT follow each other both during the 1985-1999 period (ERBS vs. UAH) and the 2000-2017 period (CERES vs. UAH), the assumption was made that the OLR and the TLT would also follow each other from 1999 to 2000, from the first half of the record to the second half. 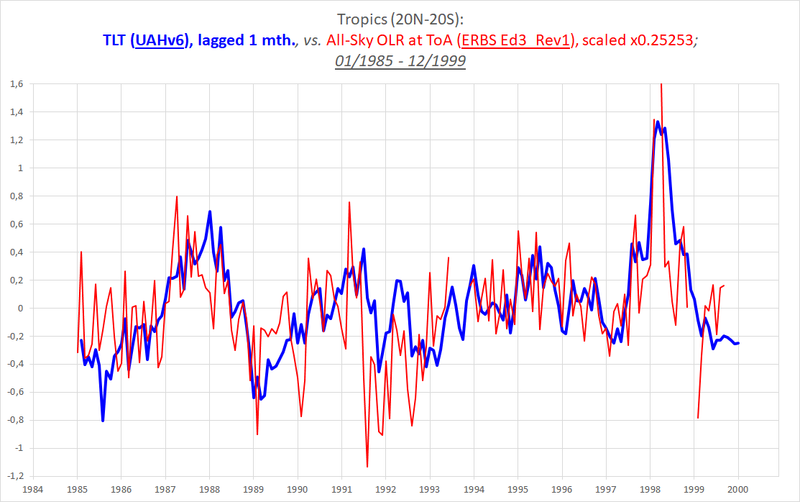 *1 Te (OLR→; ERBS Ed3_Rev1) vs. Ttropo (TLT; UAHv6), 1985-1999, tropics. …..OLR: 72d avg., 10°×10°; TLT: monthly avg., 2.50°×2.50°. *3 Te (OLR→; CERES EBAF Ed4) vs. Ttropo (TLT; UAHv6), 2000-2017, tropics. …..OLR: monthly avg., 1°×1°; TLT: monthly avg., 2.50°×2.50°. This initial hypothesis was then made ready to be put to the test. I combined the two separate OLR curves (ERBS and CERES) into one by placing them on top of the single TLT curve (UAHv6), adjusting them in such a way and to such an extent that they matched the overall progression of the TLT curve from 1985 all the way to 2017. Now, keep in mind that doing this is not (!) itself proof that the match is real. I did the adjusting. To make it all match. 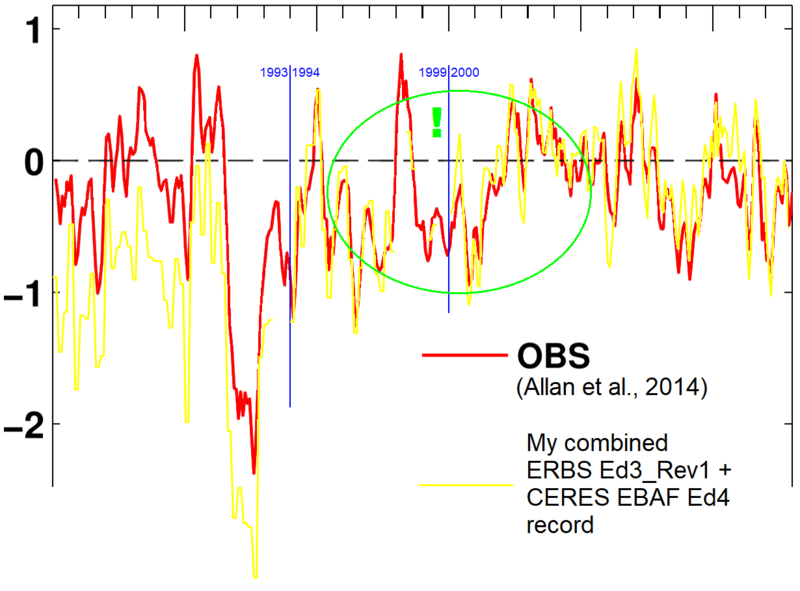 The resulting combined OLR series (really, the offset between the ERBS and the CERES data) had yet to be confirmed. At this stage, it did nothing but visualise the prediction of my hypothesis, that the OLR would also follow the TLT across the 1999-2000 data gap. The particular hypothesis whose validity I was going to test. And I ended up testing it against other, independent radiation flux datasets with the particular utility of actually spanning the 1999-2000 ERBS-CERES data gap, like the ‘ISCCP FD’ and the ‘HIRS’ datasets (Step 3, below). *5 Te (OLR→; ERBS Ed3_Rev1+CERES EBAF Ed4) vs. Ttropo (TLT; UAHv6), 1985-2017, near-global; *2 and *4 combined. 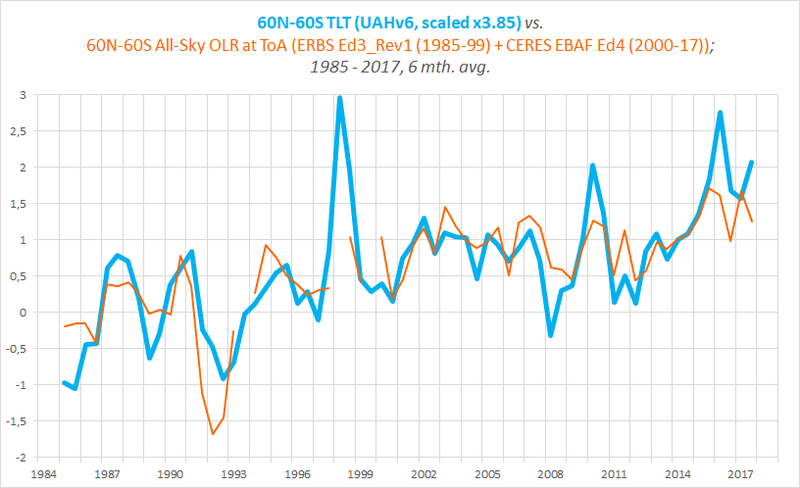 *6 Te (OLR→; ERBS Ed3_Rev1+CERES EBAF Ed4) vs. Ttropo (TLT; UAHv6), 1985-2017, near-global; 6 mth. avg. 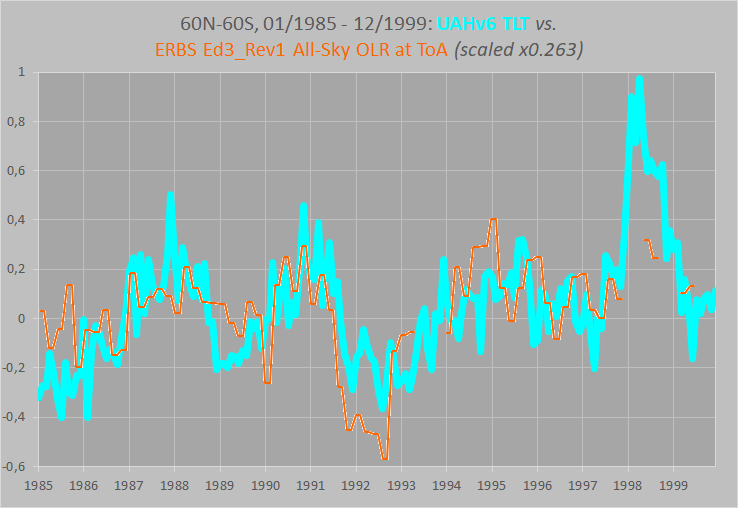 *7 OLR (ERBS Ed3_Rev1+CERES EBAF Ed4), 1985-2017, near-global, with TLT-calibrated offset from *5. Completing the test, I gained solid verification that the offset I had originally chosen was in fact more or less spot on. My prediction indubitably hit the mark. Which means my hypothesis stood firmly up to the test, adding greatly to the credibility of my composite OLR data record matching the overall progression of the TLT data from 1985 to 2017. *8 Testing the TLT-calibrated offset in OLR between the ERBS and CERES datasets in *5 and *7 against ISCCP FD. *9 Testing the TLT-calibrated offset in OLR between the ERBS and CERES datasets in *5 and *7 against HIRS. But I would still consider this − the +0.92 W/m2 offset at the 1999-2000 splice between the two separate observational datasets − to be the ‘weak link’ of my 1985-2017 composite OLR record. In fact, I’d expect this to be the only part that could realistically be ‘challenged’. Otherwise you would somehow have to find a way to challenge the validity of the contributing observational datasets themselves. On either side of my splice. Does the 1985-2012 OLR reconstruction of Allan et al., 2014, somehow refute my 1999-2000 offset? On the contrary, it soundly verifies it! Its final reconstructed OBS curve (the red one in their Fig.2b) matches more or less perfectly with mine across the 1999-2000 data gap (ERBS, 1994-1999, & CERES, 2000→). Which means that, rather than providing countering evidence suggesting my particular offset might after all be incorrect, it distinctly provides yet more independent evidence in direct support of it. Figure 3. Left half shows (in red) Allan et al.’s final OBS OLR curve isolated, originally displayed in their Fig.2b superimposed on the model curves. Right half shows (in yellow) my composite (ERBS+CERES) near-global OLR record that I constructed in my “THE DATA:” post, and which can be seen also in Fig. *7 of this post. Both curves span the time interval 1985-2012 and are equally scaled. No, he isn’t. What I’m saying is, Allan et al., 2014, and I do NOT disagree on the specific mean-level offset necessary between the ERBS and the CERES datasets across the data gap between them. [Which, as it happens, is the only thing that I’ve calibrated myself; the only thing about my full 1985-2017 composite record that I myself am personally and directly responsible for. The rest is just the official ERBS Ed3_Rev1 (Wong et al., 2006) and CERES EBAF Ed4 (Loeb et al., 2018) 60N-60S data. I’ve done nothing except plotting it.] On this, we agree completely …! So where’s the actual discrepancy to be found? Well, it’s pretty plain to see, isn’t it? 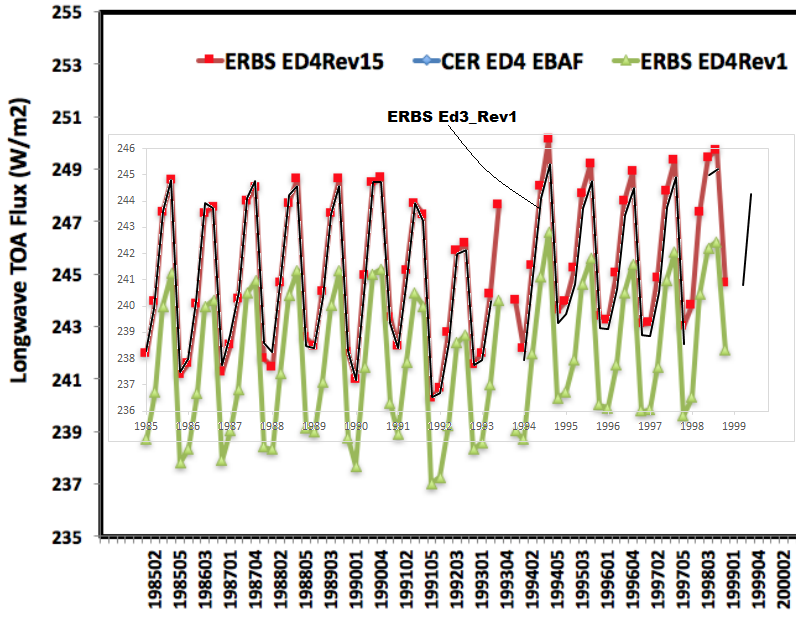 Across the 1993 ERBS data gap. Which is to say that, in the end, what this paper all boils down to, is Allan et al. simply taking it upon themselves to arbitrarily (?) 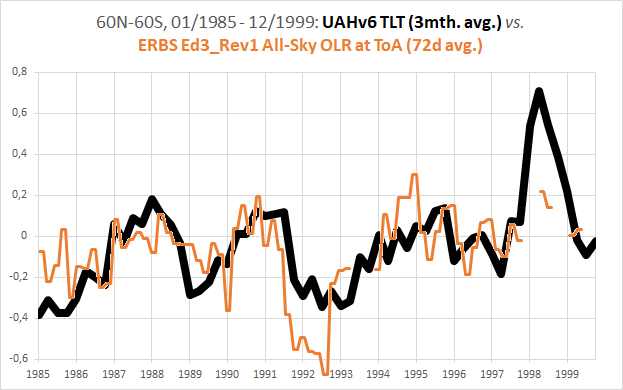 “correct” the ERBS Ed3_Rev1 dataset, as it seems, without even asking the people actually in charge of it what they might think, to create the impression that near-global all-sky OLR at the ToA did not increase in the least, but stayed completely flat overall (Fig.3, left panel), between 1985 and 2012, during a period of time when surface and tropospheric temps rose by ~0.3 °C, which should have resulted in a general increase in the OLR flux worth of about 1 W/m2. Level OLR accompanied by rising T over time is, after all, what “we” (as in ‘MCS’) want to see. Because that’s theoretically the identifying mark of an “enhanced GHE” being the driver of the warming. 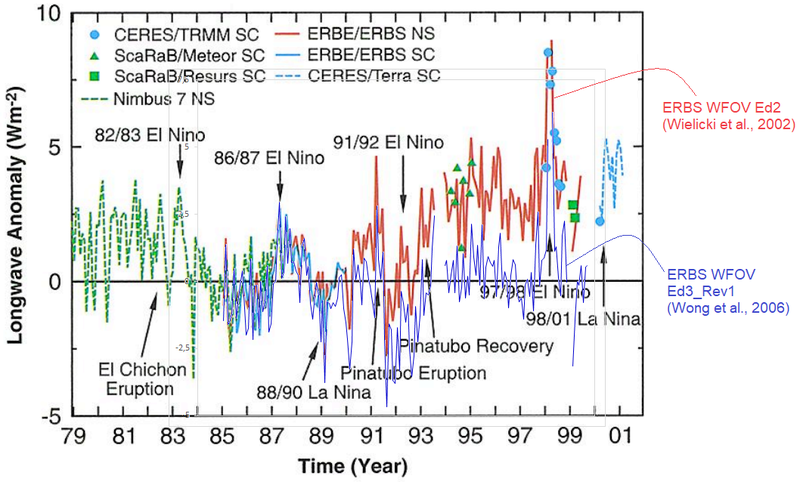 You will note that the blue model mean tracks the yellow observations relatively well from 1994 (beyond the depths of the Pinatubo trench and the 1993 ERBS data gap) onwards, but not at all from 1985 to 1993. [Keep in mind, when studying Fig.5 above, how the models tend to assume an unnaturally extended rebound period after large volcanic eruptions like El Chichón (1982) and Pinatubo (1991). It the latter case, it apparently took ten years after the original blast (all the way to mid 2001), according to the models, before the OLR level had managed to increase back and restabilised at the ‘zero level’. This, then, is the real reason why the blue model curve appears to agree so well with the yellow observations curve from 1994 to 2001. The observations curve does not rise out of the Pinatubo deep in the form of a slow rebound like the model curve does. It simply tracks the tropospheric temps (TLT), and rather shifts up in one step following the 1997/98 El Niño, just like they do. 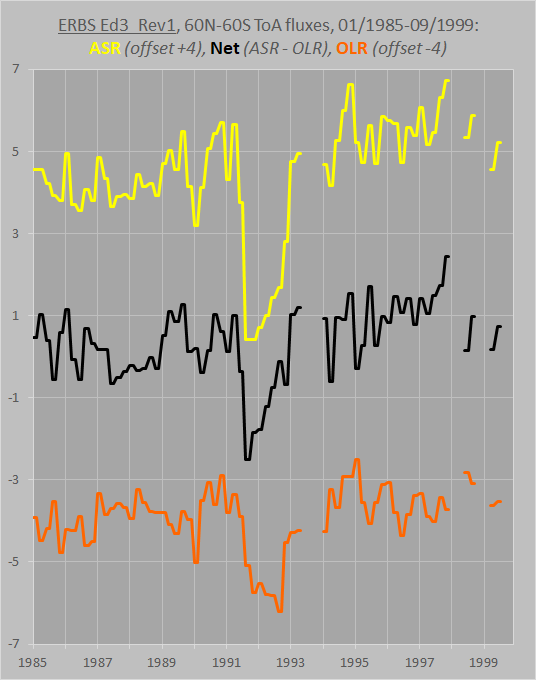 The flat post-Niño TLT trend (1998/99 →) is the reason why the mean level of the yellow OLR observations curve in Fig.5 stays flat as well. If the OLR had stayed flat because of an “enhanced GHE”, like the models assume, the TLT should – during the same time period – have gone markedly up. They didn’t. Figure 6. Allan et al., 2014, Fig.2b. The red curve is the one I’ve isolated in my Fig.3. “We use a subset of nine climate models from the Coupled Model Intercomparison Project 5 (CMIP5) detailed in Table 1. Ensemble means are constructed from amip simulations (atmospheric models with prescribed observed sea surface temperature and sea ice and realistic radiative forcings, as part of the Atmospheric Modeling Intercomparison Project 5 design, AMIP5) and coupled climate model simulations which include fully circulating oceans using realistic radiative forcing up to 2005 (historical experiment) and projections from the rcp4.5 scenario after 2005 (labeled CMIP5). Figure 7. Compare this with Fig.5 above. Figure 8. Compare this with Fig.4 above. 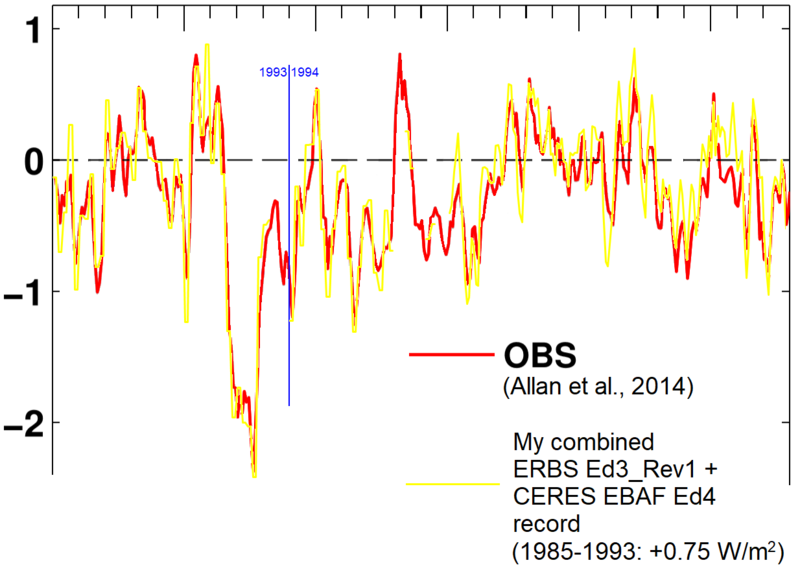 At this point it seems there’s really only one thing left to do, and that is to investigate Allan et al.’s decision to adjust, en bloc, the 1985-1993 segment of the ERBS Ed3_Rev1 60N-60S OLR data up by 0.75 W/m2. Do they provide any kind of explanation or justification for this particular move? “Finally, the reconstructed data is subjected to a homogeneity adjustment as described in the main text [below]. The reason for this is that inaccuracies may be present during the period inﬂuenced by the gap between WFOV [ERBS] and CERES measurements in 1999-2000 and potentially also during a gap in the WFOV record during 1993 [Trenberth, 2002]. Since there is no way to know the true changes during these periods, we use the following method. This, then, is what it all comes down to: Trenberth et al.’s expressed worries back in 2002 that something of significance might’ve occurred during that 1993 ERBS data gap that would forever compromise the validity of the entire dataset. Even though it was never a fact-based claim. Even though it was always just a speculative ‘concern’. So what did Trenberth actually say? Figure 9. Wielicki et al., 2002, Fig.1 (red curve: ERBS Ed2), with the ERBS Ed3_Rev1 series (thin, blue, solid curve) superimposed for direct comparison by me. 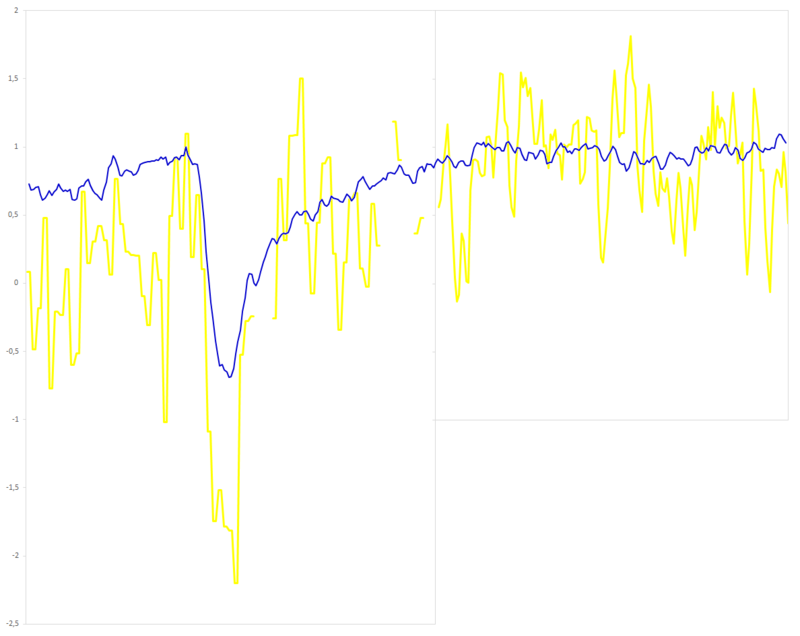 The difference in mean levels between the two versions during the latter half of the 90s is a good 3 W/m2. “We have carefully considered Trenberth’s concerns regarding our papers and have reached the following conclusions. “The original and Edition2 ERBE/ERBS Nonscanner WFOV data contain small systematic errors that can affect the interpretation of decadal changes. 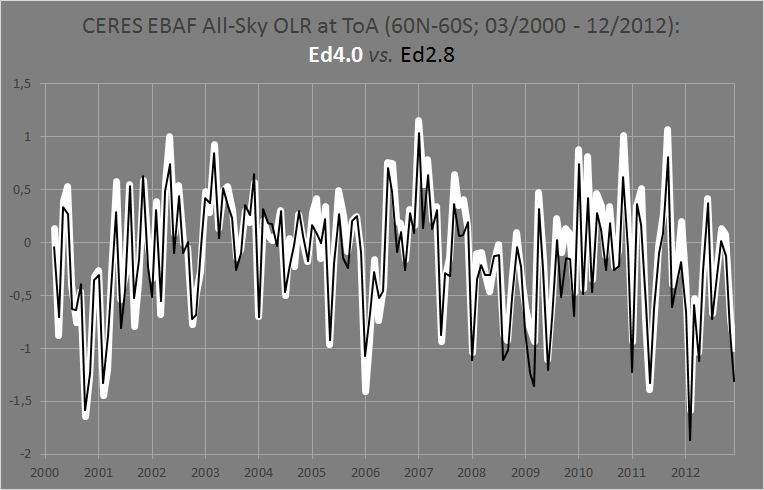 Specifically, ERBS altitude slowly dropped from 611 to 585 km over the 15-yr period. This introduces a 0.6% correction to the decadal changes reported in a previous study. This altitude correction has been used to produce an updated ERBS Nonscanner WFOV Edition3 dataset. Conclusion: The issue in 2002 was not an issue in 2013-2014, at the time when Allan et al. wrote and published their paper! The rather bizarre situation we’re dealing with here, then, is that Allan et al. STILL (! ), in 2014, decided to simply reject the mean level of the pre-1994 segment of the official ERBS Ed3_Rev1 dataset of Wong et al., 2006, as somehow spuriously low; and not just by a little bit, but by a full 0.75 W/m2 for the 60N-60S All-Sky ToA OLR flux. All purportedly based on lingering ‘worries’ that “inaccuracies” MIGHT POTENTIALLY be present “during a gap in the WFOV record” in 1993, a concern originally raised, but immediately shown to be unwarranted by the ERBS team itself, by Trenberth et al. in 2002. Figure 12. HIRS & AVHRR. Consequently, we have exhaustively, comprehensively and thoroughly shot down and buried Allan et al.’s “Trenberth excuse”. So what was the REAL reason behind the Allan et al., 2014, OBS adjustment? The observational DATA is brought into compliance with the MODELS. The real world is forced to agree with the “enhanced GHE hypothesis”, not the other way around …! PS: A funny (?) sidenote: Richard P. Allan, lead author of the Allan et al., 2014, paper, is listed as the third author of the Wielicki et al. paper from 2002 that roused this entire kerfuffle to begin with, and which notably included the original to my (modified) Fig.9 above. Figure 14. Tropical band (20N-20S). Green curve: Revised (calibrated) Ed4. Black curve: Ed3_Rev1. Absolute (NOT deseasonalised) data! Figure 15. Near-global band (60N-60S). Red curve: Revised (calibrated) Ed4. Black curve: Ed3_Rev1. Absolute (NOT deseasonalised) data! No sign, even upon reprocessing in 2017, of any upward adjustment of the pre-1994 segment of the time series relative to the post-1993 segment, neither in the tropics nor in the near-global. (If anything, rather the opposite.) Which appears to confirm the conclusion of Wielicki et al., 2002b, and Wong et al., 2006, both referenced in the 2007 AR4 chapter on the ToA radiation budget, that careful inspection of the sensor calibration following the three-month powering-off in 1993 of the on-board battery revealed no known issues to explain the decadal shift in fluxes that remained even after the corrections made in 2006 relating to diurnal aliasing and satellite altitude decay. Data Quality Summary (July 2017). Further description (January 2018). You will notice how they directly reference Allan et al., 2014, and their model data. This entry was posted in Climate adjustments, Datasets and tagged Allan et al. 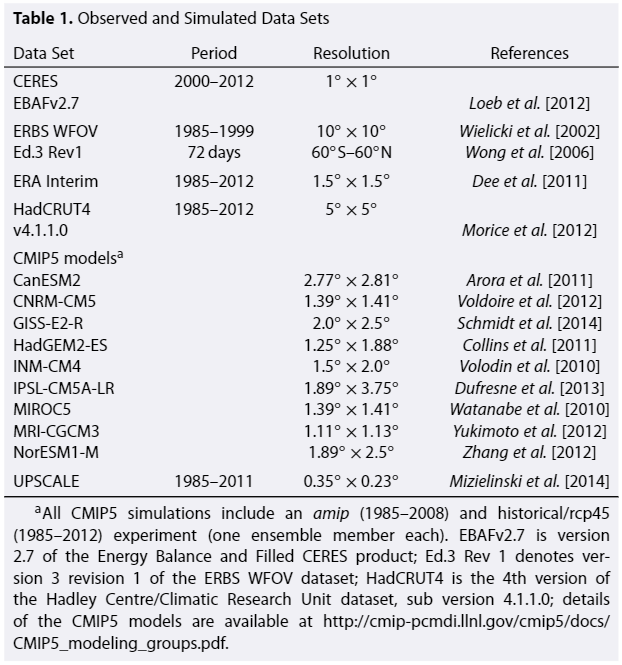 (2014), CERES, climate models, CMIP5 model mean, ERBS Ed3_Rev1, ERBS WFOV Nonscanner, Kevin Trenberth, OLR at the ToA. —So, is “Nate” correct? Am I proven wrong? I think a doubling of CO2 causes 0 to .5 C of warming. And having 200 ppm or more of CO2 causes the average temperature to be higher, but there other factors which much larger effect upon the global average temperature. So I am interested in lower my uncertainty of 0 to .5 C, ie, is closer to 0 or .5 C.
And even if a doubling of CO2, of 200 to 400, or 400 to 800 ppm is very close to 0, that doesn’t necessarily mean 50 to 100 or a 100 to 200 ppm does not cause a higher amount warming. Now, I think Earth average temperature is due to the average volume temperature of the oceans which is currently about 3.5 C.
And I think it helpful to characterize Earth’s climate is too extremes, which are an icebox climate and a hothouse climate. And we are in an icebox climate, and icebox climate as an average volume temperature of the ocean of between 1 to 5 C. And a hothouse climate, the ocean temperature is 10 C or warmer. And tend to think that presently we are continuing to accumulate in the oceans and/or it seems this has been occurring for a century or two. And such accumulation is the “control knob”. If the ocean surface temperature was 3.5 or even 10 C, our world would have very low average temperature, and what makes the average global temperature is the ocean surface temperature. What continuously warms the world is the high average surface temperature of the tropical ocean surface temperature, which is around 26 C but what maintains global average temperature is the entire ocean surface temperature is which about 17 C.
And of course if tropical ocean which is about 40% of area of entire ocean were to lower to 17 C, that would significantly lower the average of entire ocean. And the average land temperature is about 10 C, and being only 30% of surface one gets a global average temperature of about 15 C. Now if tropical land or warmer land regions below say 30 degree latitude north and south had average temperature of 10 C, that also significantly lower the average global land temperature. But that warmer land near tropics is not doing much to warm lands outside to the tropics, or the tropical ocean is warming the rest of the world, and tropical land is only bringing up the class average temperature score. Or in the class of land students, the tropical land students has higher test scores, but they are not doing much to raise the test scores of the rest of the class, but are increasing the average score of the class. In ocean class, the tropical ocean is warming [or improving how well they score on their tests] of the rest of ocean class, and the whole land class. as well as increasing the both classes average scores. The largest effect of tropical and the entire ocean surface average temperature is increasing the average mean low temperature of the land. Or prevents land from getting as cold at night or winter. Or the hot Sahara desert is prevented from getting colder at night because of higher average air temperature created by the tropical ocean. Sahara is warmed by higher average temperature ocean, and hot Sahara does not warm the ocean. Ocean warms and land cools. If average volume temperature of ocean was 5 C rather the 3.5 C, this causes the ocean surface temperature to be warmer outside to the tropics, or increase average ocean surface temperature from the current 17 C to a higher average temperature. And the last interglacial period, the Eemian did have a ocean temperature of about 5 C [and Germany had much higher average temperature]. What makes land hot, is dry land, and sun getting near zenith, and the Eemian would have had wetter lands outside of the tropics, so if anything, less hot days on land. And if have less hot days, Earth loses less energy to space. [land cools less]. Oh, didn’t get to what wanting to get to, why is ocean surface warmer on average than land? There number of reasons, but I think an important factor is an ocean is warmed by indirect sunlight. Hi Kristian, interesting enough. However, I derive OLR as equal to ASR minus “B”, the “radiative imbalance”, which is approximately the rate of change of the ocean heat content. I let P = ASR = (1-a)S/4, where “a” is planetary bond albedo, S is the solar constant. Also let “e” be the bulk atmospheric emissivity with resect to the upward surface flux, Then it can be shown that upward surface radiative flux = (P-B)/(1-e), and OLR=(P-B), averaged over the globe. 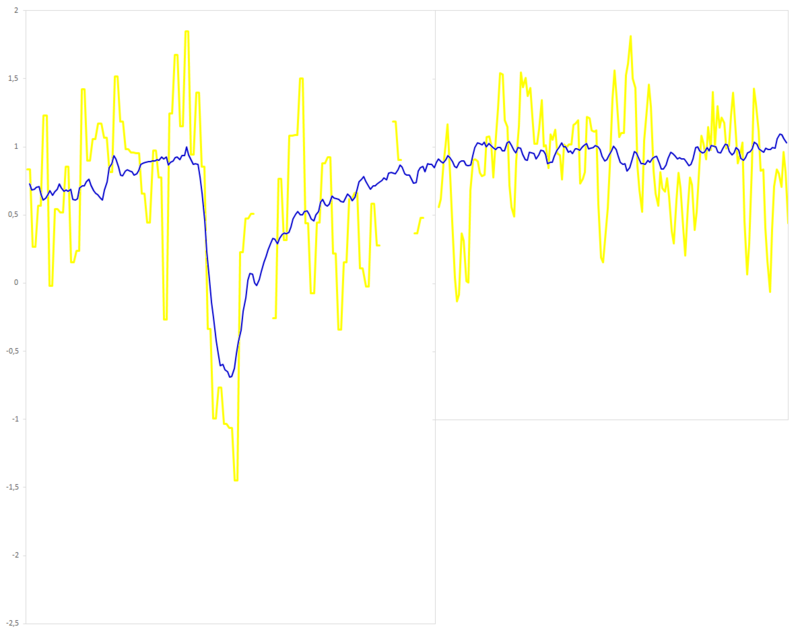 It is then possible to derive time-series graphs of “a” and “e” over the satellite era, and changes in “a” are shown to be the cause of increased upward surface flux. “e” hasn’t changed much (down very slightly). So I must agree with you that change (increase) in what you refer to as ASR is indeed the driver of increased surface temperature. But I must add that I totally disagree with you about the greenhouse effect. Greenhouse theory (actually it’s just Stefan-Boltzmann Law) is the foundation of the model I just described. Any reason you don’t consider using HIRS v2.2 OLR? It’s the one I use for pre-CERES OLR. Could you perhaps provide some of your timeseries graphs of “a” and “e” that you speak of …? Either just post them here directly in the comment section, or at least link to them. It would be appreciated. HIRS v2.2 is a monthly record, if I’m not mistaken. I tend to prefer the daily record (v1.2). It’s all in there. Figure 7 if I recall. Best regards. Thanks, Luke. Much appreciated. Looks interesting. Looking forward to reading it.